By the time this reaches the paper, the Lake Minnetonka Association’s 9th Annual Clean Up event will be over. During the event, volunteer SCUBA divers search various areas of the lake bottom and bring in trash and treasures. This event highlights the need for us all to do our part in keeping Lake Minnetonka clean. This event requires a Special Event Permit from the Lake Minnetonka Conservation District. The permit requires the submission of an Aquatic Invasive Species Prevention Plan to assure all necessary steps are taken to keep unwanted invasive species out of our lake – a good thing. The prevention plan I submitted with the permit application included a requirement that all watercraft not already residing on Lake Minnetonka arrive clean and dry (inside and out), that all divers’ gear arrive clean and inspections of both. Upon review, LMCD Executive Director Greg Nybeck called me and said he was concerned because Prior Lake’s Clean Up event was the week prior and many of the divers would be participating in both events. Prior Lake is infested with zebra mussels. He said he would add the requirement that no boats participating in Prior Lake’s event the week before the Lake Minnetonka event would be allowed to participate in the Lake Minnetonka event. Greg asked if I would be agreeable to that, and after a few seconds’ thought – yes of course I would. First of all, thanks to Greg and the LMCD. The Lake Minnetonka Association has been calling for agencies to step up and aggressively protect Lake Minnetonka for years. Greg’s action is a clear demonstration of what we have been advocating. Secondly, thanks to Greg for setting a high standard for future action for the LMA and others to follow. As we have notified the divers, I have been receiving some pushback. (“Divers do not transport zebra mussels! What gives the LMA the right to require more than the MN DNR recommends? This is a public lake – you cannot prevent us from entering.”). While there is some truth in all of these sentiments, these are exactly the reasons zebra mussels and other aquatic invasive species (AIS) are moving – it always seems to be someone else’s issue. Over the years, it seems every group I speak to or encounter – lakeshore owners, anglers, boaters, SCUBA divers, sailors, marina operators, transporters, dock installers, etc. – claim their group is clean and others’ are the carriers. The LMA does not have explicit ‘rights’ in a case like this, but we do have responsibilities and obligations to set an example. And Lake Minnetonka is a public lake, but when the LMA hosts or the LMCD permits an event inviting participants who could be bringing AIS, we have a trust to uphold and we should set an example. Please, don’t become complacent, as I had. 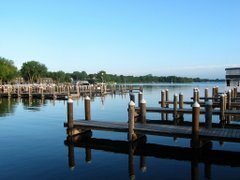 Please, all lake users, take the extra steps – every time you come to enjoy Lake Minnetonka. Make sure your boats, trailers, equipment are clean and thoroughly dry at least five days after leaving another lake (infested or not). Please everybody, urge your fellow lake users to adopt this ‘strong medicine’ ethic. This is what it will take to make sure Lake Minnetonka remains clean for all to enjoy.